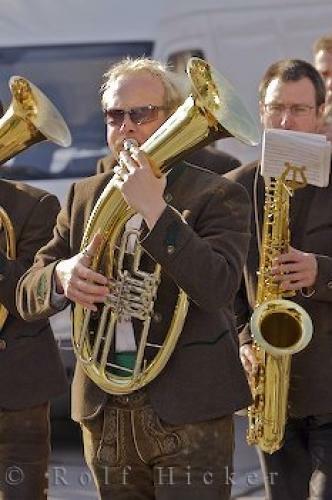 The local Putzbrunn Brass Band leads the Maibaum Festival procession on May 1st in Germany, Europe. Each member of the Putzbrunn Brass Band is dressed in traditional Bavarian Lederhosen as they lead the Maibaum procession to begin the festivities!With road blocks in place the Maibaumfest gets underway with once Brass Band is in position and the clock strikes 9am in Putzbrunn, Southern Bavaria, Germany. lederhosen in Putzbrunn, Germany, Europe.